The Sailing Sclerosis Foundation’s yacht Oceans of Hope has been unveiled at a ceremony in Copenhagen, Denmark on World MS Day (Wednesday 28 May). Former Environment Minister and MEP Lone Dybkær officially named the 20-metre yacht which will set sail from the Danish capital on 15 June on the first ever global circumnavigation crewed by people with multiple sclerosis (MS). The Oceans of Hope project aims to change the perceptions of the disease, inspiring people with MS to overcome their own personal challenges by telling the stories of those taking part – including the highs and the lows – and hosting sailing events in ports of call during the 17-month voyage around the world. 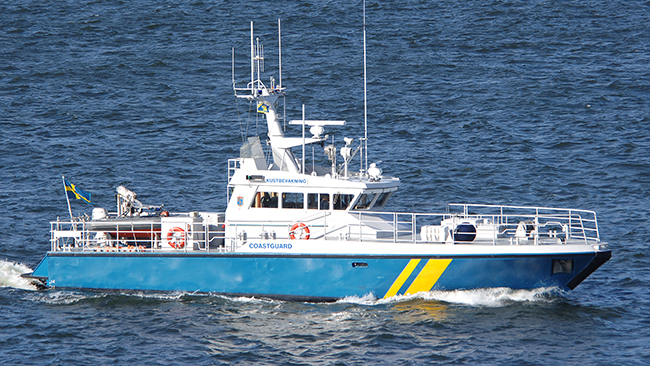 Swedish fast Coastguard vessel, KBV 301. Built by Karlskronavarvet, Sweden in 1993. Main engine: 2 x MTU, 735 kW each with KaMeWa water jets. The International Sailing Federation (ISAF) is pleased to announce that 28 young sailors from 17 nations have been approved to receive Athlete Participation Programme (APP) funding for the 2014 ISAF Youth Sailing World Championship. A call to action from RTI Race organisers for Club Teams to enter! Race organisers at the ISC are keen to encourage more Club Team entries – it’s fun! If you’re one of the 1600+ boats entering this year’s J.P. Morgan Asset Management Round the Island Race, you might be interested to know that the Race also features team competitions for boats from affiliated Yacht Clubs. May 28, 2014—The Bureau of Ocean Energy Management (BOEM) says it is moving forward with wind energy planning efforts on the Outer Continental Shelf (OCS) offshore New York. The bureau is publishing a Call for Information and Nominations (Call) to obtain nominations from companies interested in commercial wind energy leases within a proposed area offshore New York, located 11 nautical miles south of Long Beach, New York. In addition to nominations, BOEM seeks public input on the potential for wind development in the Call Area, including comments on site conditions, resources, and existing uses of the area that would be relevant to BOEM’s wind energy development authorization process. 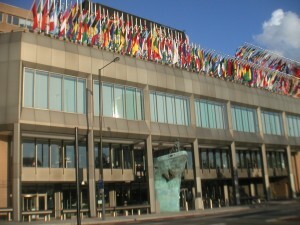 IMO’s Maritime Safety Committee (MSC) has approved, in principle, the draft Polar Code and related amendments to make the Code mandatory under SOLAS, with a view to formal adoption at its next session in November. May 28th, Koh Samui, Thailand: The sun is out, the sky is blue and a steady 10 knot North Westerly breeze, allowed PRO Ross Chisholm and his race team, to fire off three races in quick succession and catch up with the race schedule before the lay day. Quite a lot of aggression was being directed at the race organisers at yesterdays beach party but with the improved conditions and by returning to a level playing field, most crew will forget the stormy and unpredictable start to the regatta. An orderly pecking order based on size and performance has replaced the lottery like results, as normal service is resumed on the race course for all to enjoy. With the summer sailing season now well under way, the SailRacer team are busy covering many of the top sailing events from Optimists to yachts. Our unique mix of GPS tracking, online commentary and results analysis is proving very popular and creating a growing audience for sailing. A good turnout of 63 boats assembled for the 52nd running of Cowes to Deauville yacht race on Friday 23rd May to start the 102nm race, sponsored by AVEVA Group plc and organised jointly by the Royal London, Deauville, JOG, and the Royal Southern Yacht Clubs. However, the weather didn’t play ball. It was blowing a bearable 18-25 knots southerly at Cowes, albeit with heavy rain, out at the Nab Tower it was at 38 knots. So the race officers wisely decided on a 2-hour postponement as the Met Office was promising that the wind would moderate early in the afternoon, but stay from the south. By 1430 the wind had done just that and the fleet set off in three separate starts, but somewhat depleted, as some boats had decided that this weather was not for them and had already retired. May 27, 2014—One of the leading shipbuilders of offshore support vessels in the world, Eastern Shipbuilding Group, Inc., Panama City, FL, recently delivered the M/V Bravante VII, the third in a series of STX-designed 4,500 dwt Platform Supply Vessels to Boldini S.A., Bravante Group of Brazil. 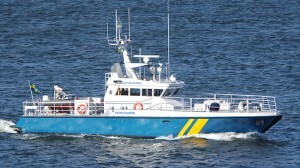 The Bravante VI, the second in the series, which was delivered three months ago, is currently on charter to Petrobras in Brazil. The series of PSVs for Boldini are being constructed by Eastern Shipbuilding with the assistance of a $240.8 million Title XI shipbuilding loan guarantee.